Welcome to Battle of the Books! West Yadkin Elementary invites rising 4th - 6th grade students to embark on a reading adventure. The Battle of the Books is a reading focused quiz competition. Team members read, read and re-read! The list for the 2018-2019 year is filled with exciting stories for boys and girls. Grab a book and dive in! Elementary Battle of the Books is a program that challenges students to read a selection of novels and compete as a team in answering various questions. The purpose of Elementary Battle of the books is to motivate students to read, monitor their own comprehension, and become active participants in book discussions. 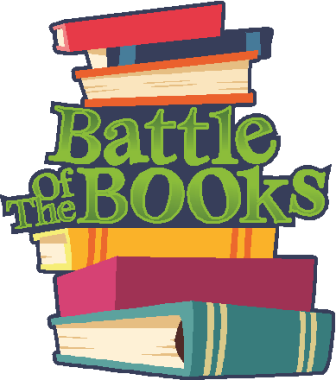 Battle of the Books encourages students to read quality literature on a variety of topics and themes, The books are written at different levels that will both challenge and entertain student. Through Elementary Battle of the Books, we strive to promote a love for literature and the important character education goals of teamwork, respect, and good sportsmanship. o Read 5 EBOB books from your grade level (and pass AR quizzes) by November 15th. The West Yadkin Elementary Battle of the Books county competition will be held in March at Starmount Middle School. We invite parents to attend and show their support. o Read the rest of the EBOB books by March. o Re-read grade level books by March. o Have a good attitude, excellent behavior, consider teammates’ suggestions, and follow directions. *Team members are expected to meet personal and classroom reading goals in order to continue with the EBOB team. We can only take 12 students to competition so students should try their hardest to meet the guidelines. Students who read the most books and demonstrate knowledge of the books will compete at the district level. Only 6 team members will play in each competition round. Team members who have leading scores on the most books read and the most questions answered correctly will play more frequently in competition rounds.